Supergirl reveals the truth about Mon’El when the mysterious aliens that have been pursuing him throughout the season finally make it to Earth. The truth about Mon’El’s origins could be one of the easiest to predict reveals in all of TV history. Ever since he was introduced I had absolutely no doubt that Mon’El wasn’t who he said he was and would turn out to be the Prince of Daxam rather than a Palace Guard like he claimed. I was wrong about him hiding his real name so I’m still confused as to why his parents would call him Mon’El considering it matches the name of a notable Kryptonian house. 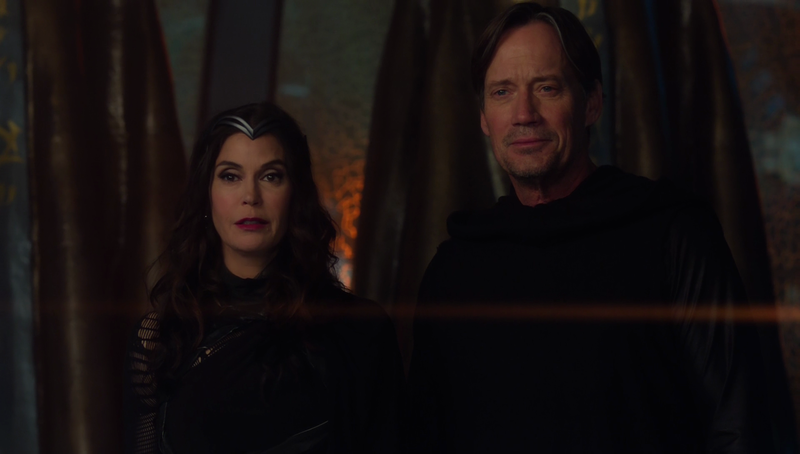 This episode is very much a throwback to the 90s with Kevin Sorbo and Teri Hatcher playing Mon’El’s parents King Lar Gand and Queen Rhea. Both actors were well placed in these roles as there was a sense of theatricality to their performance. Characters like this should be somewhat over the top and larger than life so the actors absolutely deliver on that regard. You need to look no further than the dinner scene to see how outwardly ridiculous yet charming this is. The beauty in adapting comic books to the large or small screen is that outlandish concepts like this can be played out just seriously enough to work while also keeping things light. Supergirl as a show has always been good at that and it shows clearly here. It’s difficult to take any of this seriously so the heavy lifting has to be done by the acting and the writing to make things seem worthwhile and this is largely accomplished. The episode builds on the redemptive arc that Mon’El has been going through since he arrived on the show while keeping his relationship with Kara at the centre of everything he does and says. His parents arriving is a problem for Mon’El because it confirms his worst fears. The last thing Mon’El wanted was for Kara to see him for who he really is. As far as he’s concerned he isn’t that man any more so having to confront his past is uncomfortable for him. This all comes through clearly and Chris Wood does a great job playing that discomfort. Kara’s main focus is on the fact that Mon’El lied to her but it also goes a little deeper than that. Despite the fact she is in a relationship with Mon’El her prejudice against Daxamites hasn’t gone away. Now that she knows Mon’El is the Prince she sees everything that was wrong with that planet embodied in him and is disgusted with the fact that he benefited from such a corrupt system. The only real information we get on that is Kara’s point of view that the King and Queen kept the people of Daxam drunk so they wouldn’t realise just how oppressed they are. It’s a fairly narrow minded and simplistic viewpoint which does makes sense considering everything Kara knows about Daxam comes from what she was told as a child. She didn’t have the benefit of growing up on Krypton and gradually making up her own mind based on experience so she is going by her gut instincts based on what she was told as a child. Right or wrong it’s a realistic character flaw that wouldn’t and shouldn’t disappear overnight. 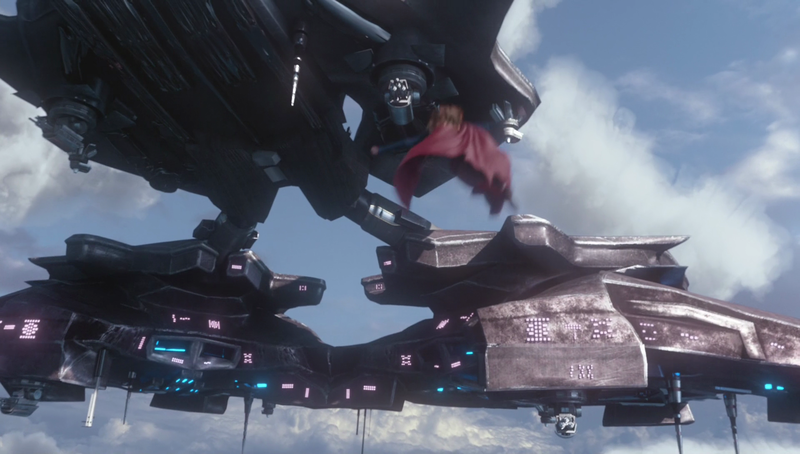 The only thing Kara can manage to do is essentially keep her distance from Mon’El until she can resolve her feelings. Being lied to for so long really stings for her because she allowed herself to be vulnerable around him and trust him enough to pursue a relationship. That trust is shattered now that she knows the truth and she’s struggling with giving him the benefit of the doubt in this case. Her good nature is still at play as shown by her telling him how lucky he is to have a second chance. He now knows that he isn’t the last of his kind so he should be glad that his parents are alive and his people can live on. This is something that Kara wishes she could have as no matter how many people she has in her life she is still really lonely because she remembers the family she lost. 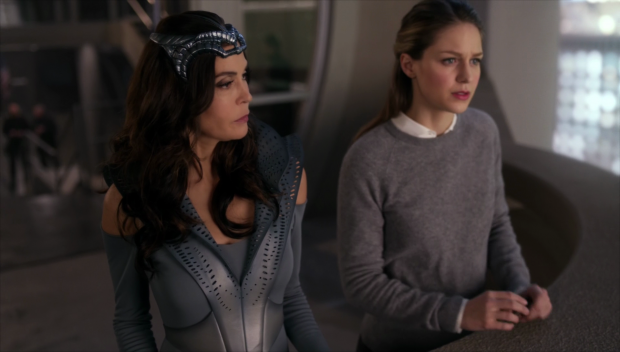 It’s easy to see that she envies Mon’El’s position and has to encourage him not to waste it. We don’t get much in the way of information on Daxam culture from the perspective of the people who live there but bits and pieces are teased. The prejudice definitely goes both ways as Queen Rhea has nothing kind to say about Krypton. The aforementioned dinner scene is really telling for that as she persistently talks down to Kara and refers to her as “Kryptonian” in a really derogatory way. This implies history between their people and I like that this isn’t ruined by lots of exposition. Teri Hatcher’s tone of voice and word choice is more than enough to tell us what the relationship between the two races was. There’s still room to explore this but it’s interesting to get the perspective on Krypton from other aliens. I’d be interested to know that Superman thinks of Daxamites because he won’t have that inbuilt prejudice that Kara brings with her from her youth. Mon’El has a difficult decision to make that he wrestles with throughout the episode. His parents want him to be the face of the future of Daxam but he clearly values the life he has built on Earth and doesn’t want to leave it. He has grown a lot and learned a lot about showing respect for other people. This is something that he never considered on Daxam and it’s clear that his parents still think themselves above everyone else. His impassioned speech about staying on Earth because being around Kara makes him a better person and he would prefer to live his life as that person rather than return to the corruption that he is ashamed of. Queen Rhea promises him that it would be different but the words seem empty to him and he decides that Earth is his future. It makes sense given his development and creates some fodder for conflict in the coming episodes. Kara breaking up with Mon’El makes a lot of sense as well. She simply can’t get past the fact that he has been lying to her all this time and can’t be with someone who is capable of doing that to her. Mon’El’s speech about how much he cares for her is another 90s throwback but Chris Wood’s performance has a sincerity to it that makes it work. The heartbreak is clear on his face and his desire to prove himself as a man worthy of Kara is clearly genuine. Despite the alien royalty plot details this is grounded in easy to relate to human emotions which makes it resonate since dishonesty is at the root of this. Winn is having his own issues with dishonesty when Lyra is revealed to be a conwoman using him to get access to valuable art. This somewhat makes up for her swift and awkward introduction which now feels deliberate since she was using the fact that he’s a sucker for a strong woman against him. Jeremy Jordan gets to show what he’s capable of as an actor as he works through the complex emotions Winn is experiencing. Firstly he feels hurt and betrayed that he has been lied to for so long but there’s also a measure of embarrassment that he allowed himself to be so easily fooled. He is clearly a very trusting person so having that exploited is a really sore spot for him. I was slightly disappointed that Lyra wasn’t entirely conning him and does actually care for him in some way. It might have played better if her feelings for him were entirely an act as it would have intensified the anguish Winn feels at the situation. If there had been a secondary reveal that Lyra had been manipulating him again just to free her brother then Winn’s emotional journey might have been even more brutal. Not that I thrive on the misery of others but these sorts of stories are somewhat predictable and it suffers because of that. The interesting thing here is that Winn’s approach is very different to Kara’s. She can’t bring herself to trust Mon’El because he lied but for Winn that doesn’t matter as his feelings for Lyra haven’t changed. Lyra may have lied to him but that doesn’t stop him wanting to do what he can to help her. Regardless of what she has done she is still someone who needs help. This brings in the final 90s throwback of the episode in the form of alien art Kingpin, Mandrax (Paul Lazenby). It feels like something that would have been right at home in an episode of Lois & Clark: The New Adventures of Superman and it plays out in much the same way. It’s somewhat disappointing that James as Guardian has to be part of this because Guardian never really works well on this show but it does make sense that James would want to support his friend in any way he can. I couldn’t help but laugh at how many times James was thrown through glass. Mandrax wasn’t an especially deep or threatening villain but I don’t think he was supposed to be. His main role was to be an opposing force to help Winn prove to Lyra how good a person he is and that she should have trusted him with the truth in the first place. It’s a strong lesson for Lyra but I’m not sure there’s a place for her on the show or in Winn’s life now that we know what she’s capable of. Maybe that’ll change now that her brother is free but this should really be a lesson for Winn in regards to trusting people he barely knows. One thing the writers of these shows have to get better at is leading into crossovers. 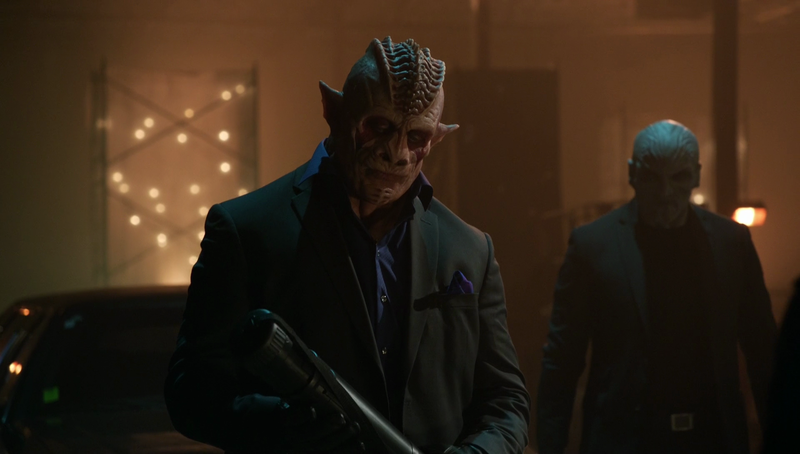 The closing minutes of the episode were devoted to setting up tomorrow’s musical crossover taking place on The Flash. Everything about this was clumsily handled from Winn randomly talking to Kara about the dimension hopping gadget Cisco gave her in the “Invasion” crossover to the awkward cliffhanger telling the audience to watch another show to see the resolution. I do think this crossover could be a welcome change of pace for The Flash after the problematic storytelling lately but the setup could have been better. Despite that I did enjoy Winn’s assumption that he and Cisco would be good friends and I hope that’s the case. Darren Criss also made a memorable first impression as the Music Meister. Colour me cautiously optimistic for The Flash this week. A solid episode that manages to ground the larger than life alien concepts with some relatable human conflicts. Kara taking issue with Mon’El lying to her is a reasonable position to take and it plays out really well. 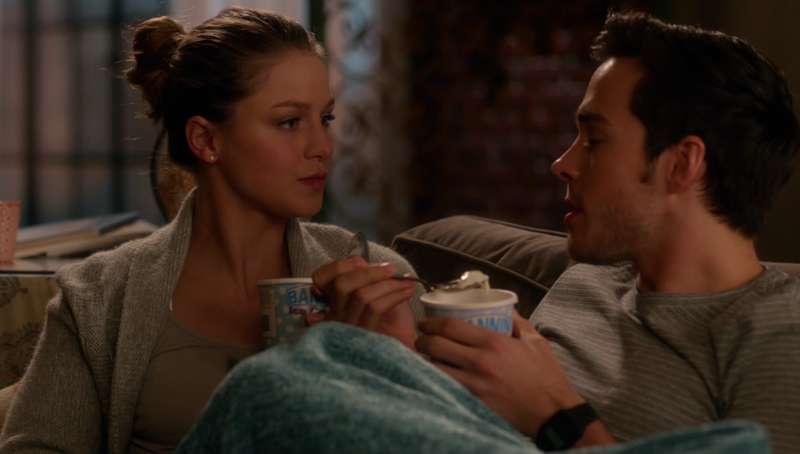 The break-up scene was appropriately emotional despite the cheesy dialogue that Chris Wood delivers convincingly. The undercurrent of prejudice between Krypton and Daxam is also handled well with Kara’s assumptions about Daxamite’s playing into how she feels and it’s made clear that the reverse is true. Kevin Sorbo and Teri Hatcher both do a good job in their roles but suffer from a lack of screen time. Mon’El’s decision to remain on Earth because he wants to be a better person does create more scope for conflict in future episodes. Winn is having a similar problem when he finds out that Lyra is manipulating him. Jeremy Jordan gets to show just how capable he is as an actor when conveying the betrayal felt by Winn as a result of this realistation. It’s interesting that he’s willing to forgive because he cares about Lyra which contrasts with Kara being unwilling to do the same with Mon’El. It’s a solid counter that allows the different approaches to be explored. I would have liked it more if Lyra really didn’t care about Winn and was constantly manipulating him rather than the predictable plotting of her actually caring about him. This episode had some fun 90s throwbacks such as the alien art dealer that would feel at home in an episode of Lois & Clark: The New Adventures of Superman, Mon’El’s cheesy romance dialogue delivered sincerely and, of course the presence of Teri Hatcher and Kevin Sorbo. 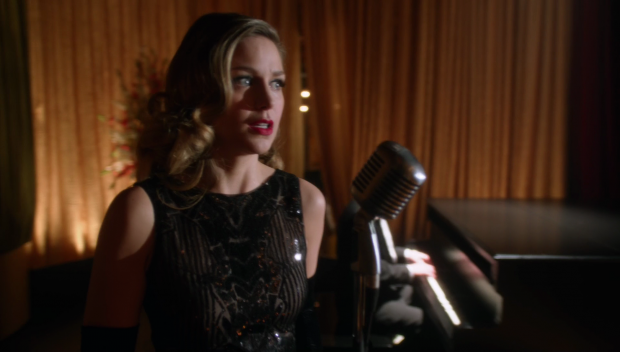 Tomorrow gives us the musical crossover between Supergirl and The Flash as set up at the end of this episode. It was really clumsily done but Darren Criss makes a decent first impression as the Music Meister.